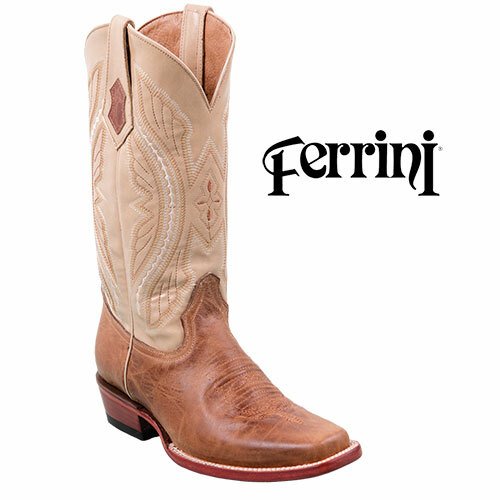 Exotic genuine kangaroo boots from Ferrini - as handsome and tough as you are! These are some of the best-looking boots we've ever sold - at any price! The vamp is fashioned from genuine kangaroo hide, that is 10x more durable than cowhide, and is topped with a contrasting 13" genuine leather shaft for a head-turning look that knows no equal. Also features a cowboy heel, intricate western stitch detail, narrow square toe, pull on straps, leather linings and leather sole. Color: Antique saddle. Mens size 13.